Alone at sixteen, Pat was determined to make a better life for her children. But with no job skills and an eighth-grade education, her options were limited. She learned quickly that hustling and humor were the only tools she had to survive. 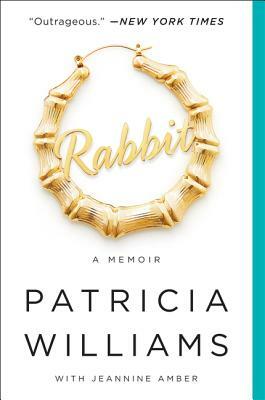 Rabbit is an unflinching memoir of cinematic scope and unexpected humor. With wisdom and humor, Pat gives us a rare glimpse of what it’s really like to be a black mom in America. Patricia Williams, the fifth child of an alcoholic single mother, came of age in Atlanta at the height of the crack epidemic. At 12, she had her first boyfriend; by 15 she was a mother of two. Williams wanted to give her children the kind of life she’d always dreamed of, but with no education or job skills her options were slim. Thus began Williams’ lucrative career as a drug dealer. After numerous run-ins with the law and a stint behind bars, Williams decided to turn her life around. She now goes by the stage name Ms. Pat and enjoys a successful career as a comedian. Williams lives in Indianapolis with her husband and three children. Award-winning journalist Jeannine Amber lives in Brooklyn with her daughter, Niko.